Meadowsweet is a perennial plant in the Rosaceae family. 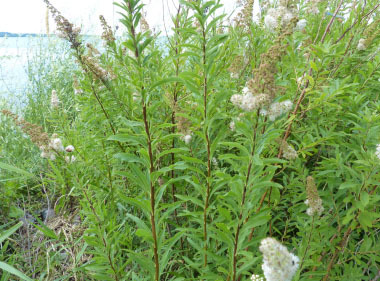 Although edible, meadowsweet is more recognized as an herbal medicine used to help with many maladies. In particular the flower head contains salicylic acid. The flowers produce nectar and pollen attracting various bees, wasps, adult long-horned beetles (Cerambycidae), and the moth Ctenucha virginica (Virginia Ctenucha). Distinguishing Features: Meadowsweet is considered a shrub rather than a wildflower and it tends to grow in colonies. When in bloom it is very easy to identify. Meadowsweet is a large, clump-forming, upright perennial that typically grows relatively tall. Flowers: Each flower is about 1/4" across, consisting of 5 white petals, 5 light green sepals, 5 light green pistils, and numerous stamens (20 or more). The petals are much longer than the sepals, while the filaments of the stamens are much longer than the styles of the pistils. Where the nectaries of each flower are located, there is a narrow ring-like structure that surrounds the 5 pistils in the center of the flower; this floral structure is pink, orange, or yellow. It flowers mid- to late summer. Fields of Nutrition has medicinal benefits and vitamin/mineral content of Meadowsweet. 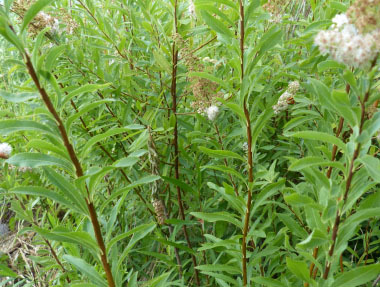 Leaves: Meadowsweet leaves are alternate (up to 3" long and 3/4" across) and occur along the young branches. The leaves are narrowly ovate, sharply serrated, pinnately veined, and glabrous (rarely sparsely hairy underneath); they have short petioles. The upper side of each leaf is medium green, while its lower side is pale green. The branches terminate in panicles of flowers. Height: This plant can reach heights to anywhere between 1 to 2 metres (3 - 6 feet). 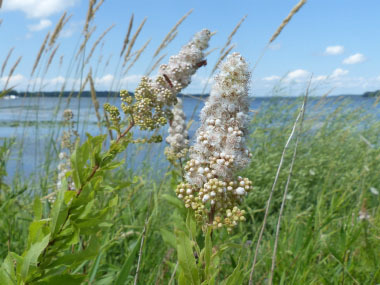 Habitat: Meadowsweet is typically found in swamps, marshes, fens, wet woods, or by lakes and rivers. It grows throughout North America, Europe, and in many areas of Asia. 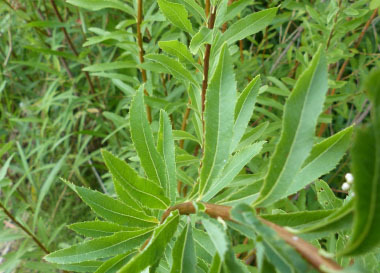 Edible parts: Young leaves are edible but are commonly used in soups and to make tea.